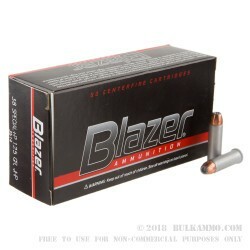 The CCI Blazer line of ammunition features aircraft grade aluminum casings, which may seem unconventional but indeed offers a few perks. First, it’s far more cost-effective than brass, which requires valuable copper for its production. Second, aluminum has only one third the weight of brass, so you may feel that difference while carrying. 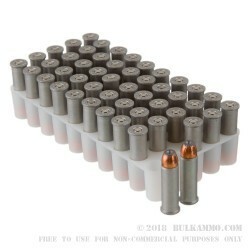 Finally, although these aluminum casings put handloading out of the question, you may take some satisfaction in knowing that your cartridges’ casings are made from the same material as the 120mm rounds used in the Abrams tank. 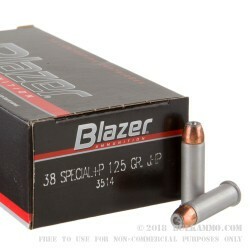 This 38 Special +P round additionally offers a 125 grain jacketed hollow point bullet, which prevents lead fouling in your barrel while still providing reliable expansion upon penetration of the target. 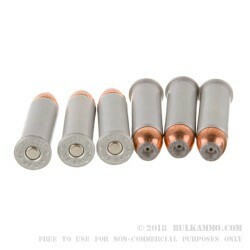 Self-defense enthusiasts recommend training with the same type of round you would rely on for personal protection, so with 1,000 of these cartridges you’ll have ample opportunity to hone your skills at the range.